The P-40 Tomahawk/Kittyhawk/Warhawk was built in huge numbers during WWII, mainly because it was all that was easily available. Basically a mediocre aircraft, it was flown by over 20 countries during the conflict, and earned a reputation as a rugged attack aircraft that could fight in a pinch. The P-40F is basically an E model with a Merlin engine replacing the Allison. Unfortunately, the Merlin did not transform the P-40 as it did the P-51 and they were only used in the Mediterranean theater and training units. 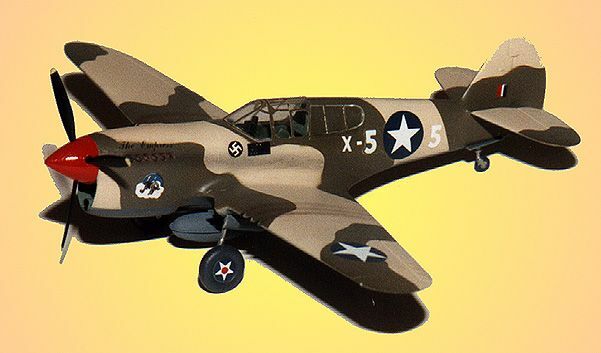 Hasegawa's 1/72 P-40 kits have been with us for quite a while and can be considered Hasegawa's second generation kits. No longer the raised panel lines, these are finely engraved. There is a spartan, but decent interior. The canopy is thin and fits well. The plastic itself is not the thick mass of earlier kits, but thin and well molded. The wheel wells are full, but devoid of detail. In actuality, this is one of the early 'toss in glue, shake the box, and there is a kit' kits. With careful building, it is devoid of any faults. I have built a number of them and still have several on my 'to build' pile, although they are falling pretty far down on the list. Back when DB first arrived on the scene with their excellent resin conversions, one area they concentrated on was P-40s. They offered B and C noses as well as elongated tail sections and the F nose. I bought them all, but the first one I used was the F nose. The F is distinguishable from other versions by the lack of a carburetor intake on the top. The conversion itself was very simple as DB gave a scale diagram of where to cut the P-40E nose. Once the fuselage is built in the normal manner, the resin nose (after cleaning) is simply grafted on with superglue or epoxy. It is an excellent fit and requires just a bit of putty and sanding to smooth it in. The reason for doing the F is a decal sheet. The first aftermarket sheet I ever bought was a Microscale sheet for the P-40 ($1.99). I used the Revell 1/72 kit and did several nice E models. However, about half the sheet was for an F. Now the F is a lot more than just sanding off the scoop as the entire radiator section is a different shape. So that sheet languished for many, many years. I chose a desert scheme from the Tunisia campaign of 1942/43. Gunze paints were used for the desert tan and OD uppers and Testor's model master for the neutral grey undersurfaces. The end result is what you see in the photo above. I thoroughly enjoyed building this kit and would highly recommend a similar conversion for your first try at a resin conversion. I am unsure of the availability of the DB range, although I am sure that there are parts available out there somewhere.